Love, loss, spirituality, tattoos and music – indeed some of the very bedrocks of life -take on a sublime urgency in The Broken Circle Breakdown, a 2014 Oscar nominee for Best Foreign Language Film. No matter how effectively a story may work onstage, a successful transition to the screen is far from guaranteed (i.e. August: Osage County). Though TBCB began as a stage play, the filmmakers recognize the different challenges a film adaptation creates, and they rise to the occasion with an achingly beautiful film. 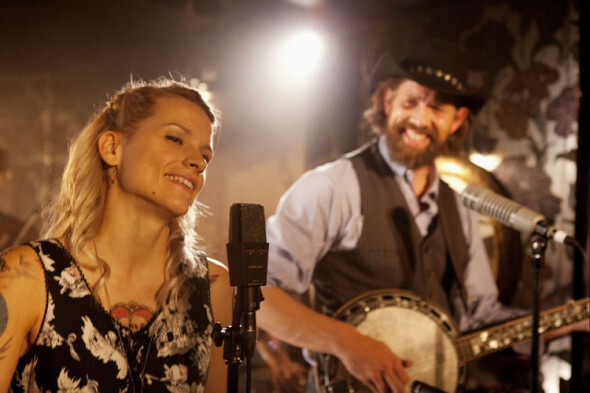 The setting is Belgium, where Didier (Johan Heidenbergh, star and co-writer of the play) showcases his love for American bluegrass music by leading a popular local band. Though he’s pragmatic, technical, and verbose, he falls hard for the emotional, quietly intense Elise (Veerle Baetens), a tattoo artist who just happens to have a pretty sweet singing voice. They begin a passionate relationship, she joins the band, and the couple soon welcomes daughter Maybelle. When Maybelle is diagnosed with cancer, the differing world views held by Didier and Elise begin to clash. Didier’s atheism and Elise’s spirituality personify the ongoing debate over science and religion, and the couple soon question themselves and each other. Director/co-writer Felix Van Groeningen presents the relationship as a graceful circle. The story cross-cuts between different stages in Didier and Elise’s life together, letting emotion trump chronology as a connective device, a strategy that pays off wonderfully. That emotion often resonates through the music they both love. In the way its songs are deftly woven into the very fabric of the story arc, TBCB recalls both Once and Inside Llewyn Davis. The most obvious difference is that TBCB utilizes English lyrics even though the dialog is in Flemish, which is a tad jarring at first but soon serves to underscore the effect that America has on these characters, and indeed the rest of the world. Both Heidenbergh (who will very much remind country music fans of singer Ronnie Dunn) and Baetens handle their own vocal duties, which seems only fitting, as there isn’t a false note in either performance. Awash in authenticity, The Broken Circle Breakdown soars on joy and heartache, tenderness and defiance, ultimately leaving you tearful, but inspired.